Rocket Matter Knowledge Base Rocket Project Management (NEW! )How to create/modify workflow statuses. You can assign Matter Types to matters for better organization and more accurate reporting. 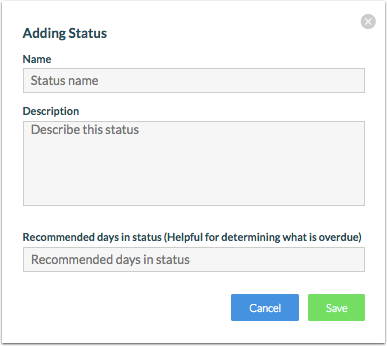 You can also build cases statuses and status transitions to track case progress individually and on a firm-wide level. Once you have added a Matter Type, create some Workflow Statuses and build Workflow Transitions to outline a roadmap for how a particular Matter Type case type should progress. 2. In Rocket Project Management, click on 'Edit Workflow Statuses'. 3. Add a 'Status' by clicking on the green plus sign in the right corner. Enter the name and description for this status. You can also add a number of days recommended in this status (optional). 4. 'Save'and review all workflow statuses. Prev: How to add a matter type. Next: How to assign a matter type and status to a matter template using Rocket Project Management.